The recent tragic fire of a public housing tower. the Grenfell, in London, built in 1974, has raised questions about the fire safety of high rise living, link. The cause seems to have been electrical, and it appears there was no sprinkler system. There was also a fire in the UAE near Dubai in March 2016 also gets similar attention, story. So I recall the 1974 20th Century Fox disaster movie, “The Towering Inferno”, by John Guillermin. At 165 minutes, it wasn’t long for the disaster movies of the day. The fire breaks out on the opening night of a new skyscraper building in San Francisco as a party goes on. Richard Chamberlain plays the bad guy landlord, who gets what he deserves, while Steve McQueen, Paul Newman and William Holden star. Modern highrises are generally safer places to live than old houses, if you rule out possible acts like 9/11. Here's a story about the "Leaning Tower of San Francisco". 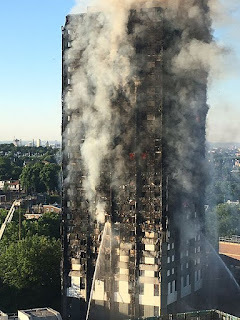 Wikipedia attribution link for picture of Grenfell Tower after fire, completely gutted, by Natalie Oxford, under CCSA 4.0. Other highrises built for low-income people have been evacuated so that fire-vulnerable cladding can be replaced. This does not happen in the US. AP story.